Established in the year 1997, we, Arrow Paper Products, have established ourselves as one of the leading Manufacturer, trader of Paper & Gift Items and we are also providing printing services for Corporate Gift Items and many other products. Our organization has gained accolades because of our commitment towards providing our clients with an exclusive printing facility as per their specific needs, while maintaining the quality. We offer Printing & Paper Recycling Services, Corporate Printing Solutions, Paper Recycling Services and Printed Bags & Covers. Our organization is backed by an excellent team of professionals, who have vast experience in the respective domains. They help us in providing our clients with customized printing solutions. We have sound infrastructure, which is installed with technologically advanced machinery that helps us in providing fine printing on various products. Furhter, we also own a Printing industry, which is located in Bala Nagar Industrial Area. Under the able guidance of our mentor, Mr. B. N. V. Kiran Kumar, we have been able to garner a huge client-base across the country. His sound industry experience and thorough market knowledge have enabled us in carving a niche for ourselves in the printing industry. We are engaged in providing our clients with optimum quality printing services. Our commitment towards maintaining high quality standards has helped us in carving a distinct place for ourselves in the market. We have implemented strict quality control measures in our entire process to ensure the best quality of our products and services. Our team of quality controllers conducts an in-depth quality check to ensure the conformity of our range with client's specific requirements and quality standards. We are a prominent service provider of Printing Services for Corporate Gift Items. Our service includes printing for Advertising Material, Customized Spiral & Wiro, RFID Certificates, Shopping Bags, TYVEK Products, Promotional Products. Apart from this, we also offer Printing Products, Go Green, Pens, Machine Made Envelops, and I.D Cards. We are offering these printing services in compliance with client's specific requirements. Our diligent professionals have in-depth knowledge of this domain, which helps us in catering to the various needs of printing industry. Founder Of Arrow Paper Products. 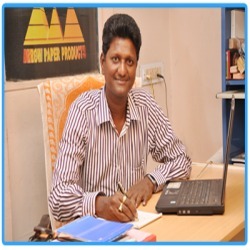 Arrow paper Products Established in 1997 by Kiran Kumar BNV, Arrow Paper Products has grown to become the largest print and print-related services in the Hyderabad, India. We have our own Printing Press in Hyderabad and we are using all the latest technologies in Print and Print Related Services to Provide Quality and Reliable Services to our Clients. Our main goal is to deliver the quality products within Turnaround Time. We are prominent manufacturer, supplier and exporter of print and print-related services, with our Digital Print, Commercial Print, Direct Mail and Marketing Services we are full filling your Print and Print Related Requirements. Our Products Include Eco Friendly TYVEK Products, Corporate Products, Promotional Products, Printing Products, Go Green Products, Machine Made Envelops, Customized Spiral & Wiro Books. We believe that there is a better way to buy eco friendly products. We want to provide the best possible buying experience by offering a wide range of print and print-related products. Our goal is for Arrow Paper Products to be your primary destination for Eco Friendly products and services. We are assisted by an adept team of professionals, who have vast industry experience and high qualifications. Our team is like an asset for us, which is strengthening our position in the market. The team members work in close coordination with the customers for ensuring utmost client satisfaction. Our professionals have developed long-term relationships with our clients by offering them highly efficient printing services. Being a client-centric organization, we are offering our clients a highly efficient range of printing services. Our complete process and business strategy is focused on achieving utmost client satisfaction. We direct all our endeavours towards meeting the client's requirements. For this purpose, our professionals work in close coordination with clients to understand their needs in a better way. Owing to our ethical business practices and transparent business policies, we have won the faith of our clients. This practice has also helped us in getting repeated orders. We have a wide distribution network that ensures safe and timely delivery of the products. We are backed by an efficient team of local sales consultants, which helps us in providing our clients with efficient services and products. Our range is focused on helping our clients in promoting their businesses and market reputation. We have proven to be a highly flexible partner, who holds specialization in helping the clients in doing their business. Being a creative organization, we are continuously offering cost-effective ideas for the growth of the client’s business. Our clients see us as a reliable partner, who is focused on attaining maximum client satisfaction. We are offering an excellent range of services with high-end technologies and innovative solutions for online print management.